At QSAN, we pride ourselves on our commitment to build highly efficient and low carbon footprint devices. To safeguard the earth and our environment, the XCubeSAN product range uses various green technologies for energy savings and minimization of your carbon footprint. The XCubeSAN product family are all equipped with dual redundant 80 PLUS Platinum modules for ultimate energy efficiency. At 50% load, these power supplies can provide up to 92% efficiency converting power from AC to DC. This efficiency means that our power supplies can greatly reduce the system’s power loss and heat generation. 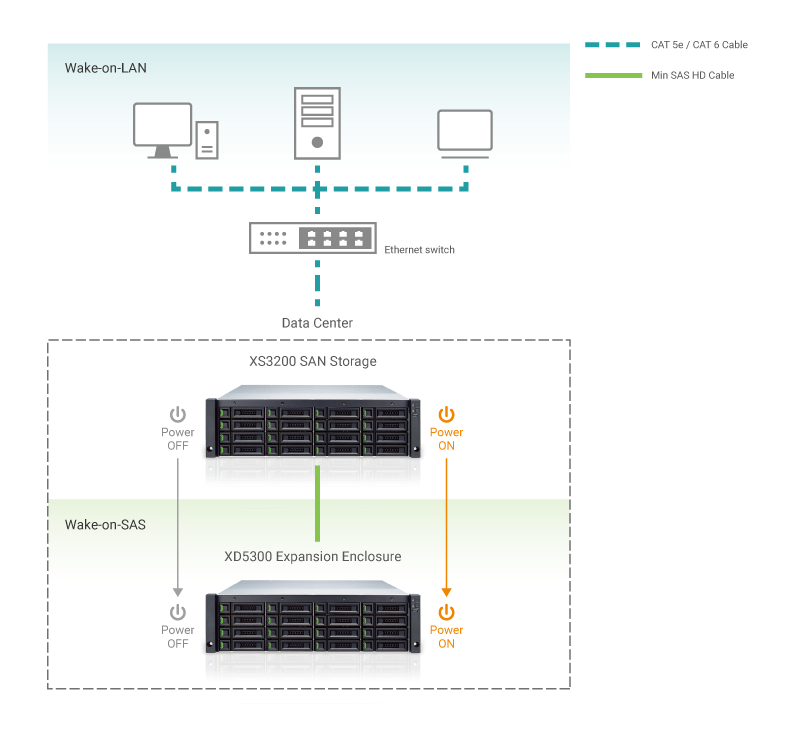 QSAN’s Wake-on-SAS technology allows you to remotely power on/off all cascaded XD5300 expansion enclosures by using QSAN proprietary SAS cables. You can power on the XCubeSAN system remotely using the Wake-on-LAN feature. The XCubeSAN system can work with any available Wake-on-LAN freeware and shareware. Wake-on-SAS ensures that expansion enclosures will not run idle, consuming electricity after the SAN storage system is shut down for maintenance or other purposes. Wake-on-SAS helps avoid unnecessary electricity waste by allowing your devices to be on only when it is necessary. A further advantage of Wake-on-SAS is that when you turn on the SAN, the expansion enclosures will wake automatically, so there is no need to worry about degrading a volume if you forget to turn them on first. The following diagram shows that after the XCubeSAN storage receives the magic packet being sent from the client’s computer, it powers on automatically and uses Wake-on-SAS functionality to power-on the attached XD5300 expansion enclosures. When the disk drives have not been accessed or are not scheduled to be accessed for a set time defined by you, the auto disk spin down functionality will kick in, and will power down the whole storage pool into a hibernation state. This gives you the freedom to optimize the energy usage of the XS3200 SAN storage system. Disk spin-down can save 60% to 70% power in low use scenarios such as backups. When the system detects read/write requests coming in, it will issue a wake command. This takes a few seconds to spin up all the disk drives in the storage pool to resume all data services. 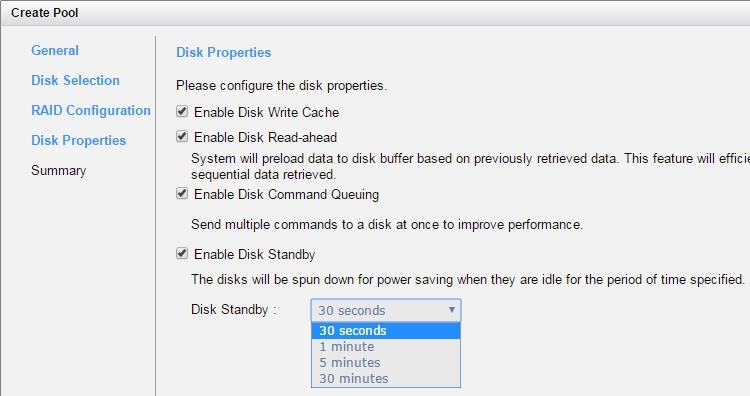 The performance penalty can be off-set with SSD cache, however.